Microsoft Office was released in 1990. Since then, it has been dominating the office suite market although there are several other alternatives out there, including the one free of charge like LibreOffice. The vast majority of Windows 10 users — and computer users generally — rely on Microsoft Office to fulfill their office needs like getting done documents, presentations, reports and so on. Majority doesn’t mean everyone. There are also Windows 10 users who prefer using other office suite with the major reason being price. Microsoft Office itself consists of three major components: Word for editing documents, Excel for editing spreadsheets and PowerPoint for editing presentations. Other office suites like LibreOffice and WPS Office also offer the same set of applications without requiring you to spend any money. Microsoft itself has actually brought Office to online which you can use for free. Or, you can also use Google Docs, Google Sheets and Google Sheets to replace Microsoft Office. But not everyone feel comfortable using online-based apps. The major problem experienced by someone who made a switch from Microsoft Office is adapting due to different user interface. WPS Office has a user interface that is extremely similar to Microsoft Office which will cut off your adaptation period. WPS Office itself is developed by a Chinese company Kingsoft. Before turning into WPS Office, this office suite was formerly known as Kingsoft Office. WPS Office consists of three components: Writer for editing documents, Presentation for editing presentations and Spreadsheets for editing spreadsheet files. This office suite supports a wide range of document formats, including Microsoft Office Format. In fact, it uses Microsoft Office Format as the default document format. One of the advantages of WPS Office is that it supports multiple tabs, something that is not available on Microsoft Office and other office suites. WPS Office has a built-in PDF exporter and encryptor. There are four themes you can choose from in case the default theme doesn’t suite you. 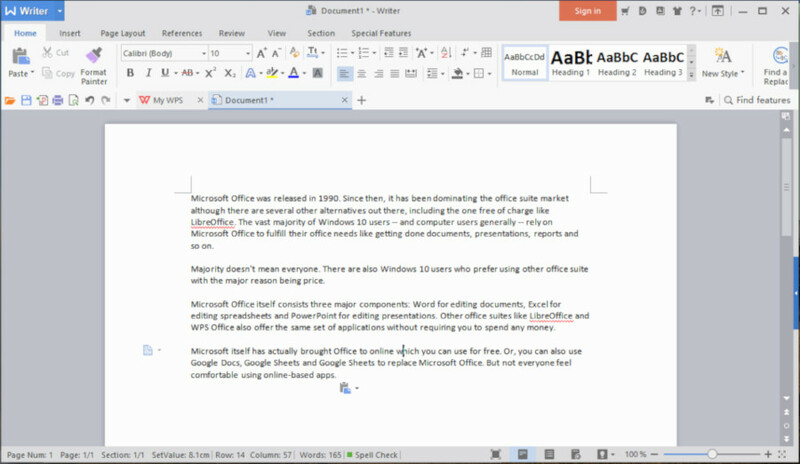 WPS Office itself is a freemium office suite. 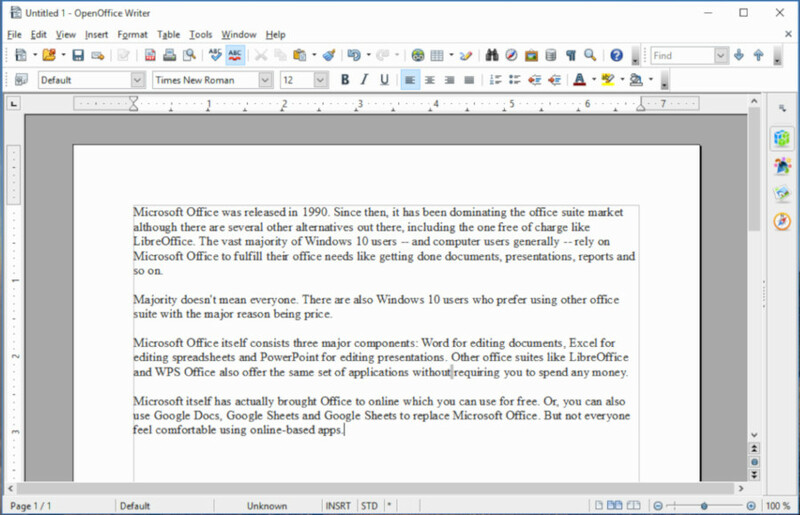 ONLYOFFICE Desktop Editors is an open source office suite developed by Ascensio System SIA, a company based in Latvia. The major feature offered by this office suite is collaboration. You can use this office suite to remote collaboration with your teammates. 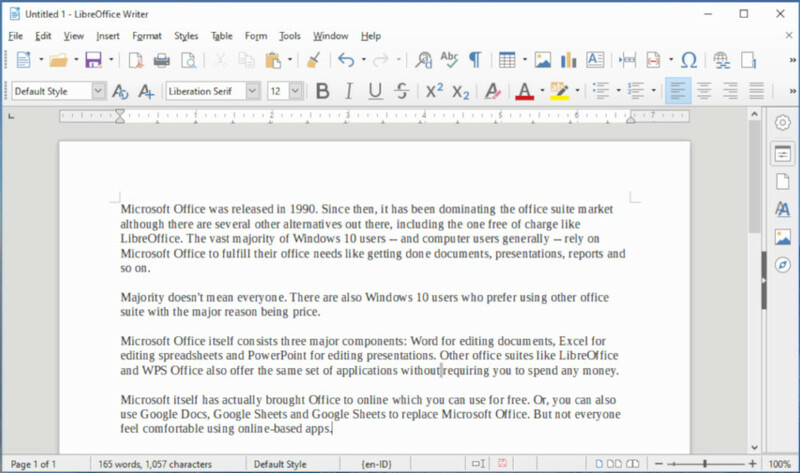 ONLYOFFICE Desktop Editors also has three major components: word processor, presentation maker and spreadsheet editor. ONLYOFFICE Desktop Editors also has a compatibility with Microsoft Office. Same as WPS Office, it also use Microsoft Office Format as the default document format. So, if you are working on a document and want to save it, your work will be saved in .DOCX by default. ONLYOFFICE Desktop Editors also has a built-in PDF exporter in which you can save your document into a PDF file without installing additional plugin. The interface of this office suite is not too similar to Microsoft Office, but it’s pretty easy to use. 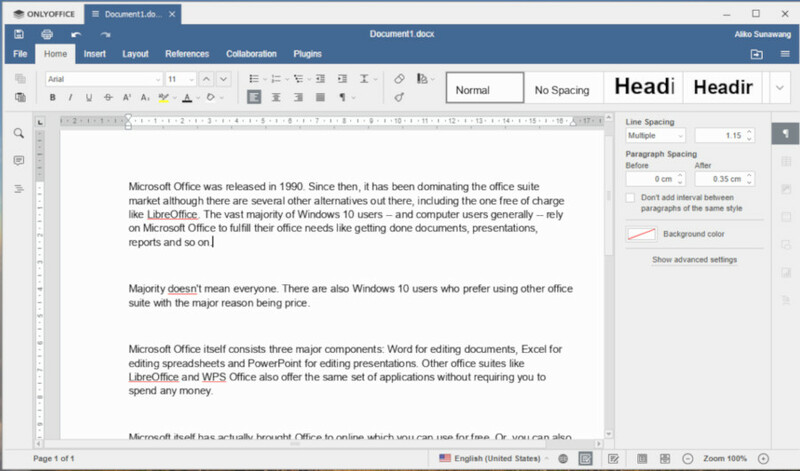 Compared to WPS Office, ONLYOFFICE Desktop Editors has fewer features. It doesn’t support multiple tabs and there is no option to change the default theme. Plugins are available to enhance the functionality of this software. Here it is. LibreOffice is probably the best alternative to Microsoft Office regardless its different interface. 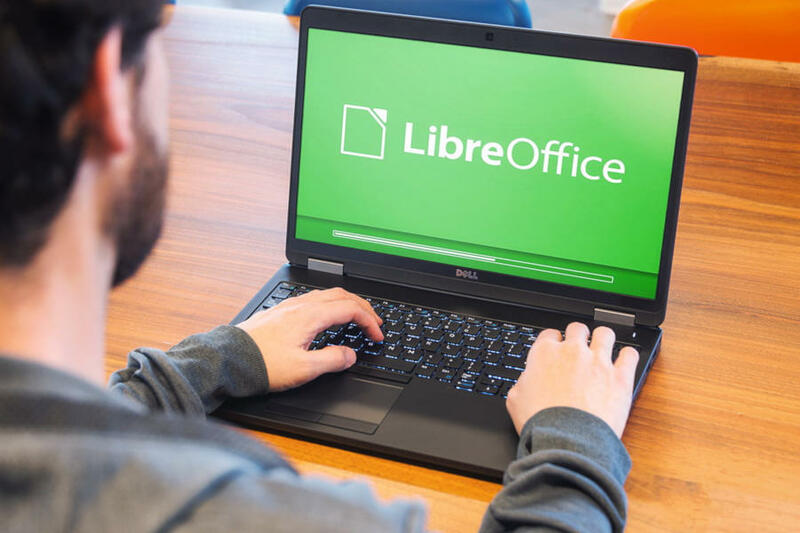 The interface of LibreOffice tend to similar to old Microsoft Office, but the features offered by this office suite are equal to Microsoft Office, may be even more. LibreOffice itself is an open source office suite developed by The Document Foundation. LibreOffice uses OpenDocument (ODF) as the default document format, but it also supports a wide range of document formats including Microsoft Office Format. LibreOffice itself was released in January 2011. Since then, it has been a standard office suite on most Linux distributions. Yes, LibreOffice is a cross-platform office suite. In addition to Windows, it is also available for Linux and Mac. LibreOffice offers more set of apps than WPS Office and ONLYOFFICE Desktop Editors. In addition to word processor (Writer), spreadsheet editor (Calc) and presentation maker (Impress), LibreOffice also offers database management tool (Base), drawing tool (Draw) and Math to work on mathematical formulas. LibreOffice also offers a built-in PDF exporter. You can also protect your document with password without installing additional plugins. As the name suggests, this office suite is developed by Apache Software Foundation. Apache OpenOffice and LibreOffice were built from the same core so the features offered by them are not much different. LibreOffice was forked from OpenOffice.org in 2010. Both LibreOffice and Apache OpenOffice are the successor of the OpenOffice.org which has been discontinued. Same as LibreOffice, Apache OpenOffice also offers word processor, spreadsheet editor, presentation maker, database management tool, drawing tool and mathematical formula composer. The interface of Apache OpenOffice will remind you to Microsoft Office 2003. Apache OpenOffice also offers a built-in PDF exporter and you can also protect your document with a password without installing any additional app. Apache OpenOffice uses OpenDocument as the default document format, but it also support other formats including RTF and DOC. Unlike LibreOffice, Apache OpenOffice hasn’t supported DOCX format.